The animal's paws were burned, but a cause of death has not been determined. A mountain lion known for crossing the Los Angeles area’s notoriously busy freeways has died after surviving the Woolsey Fire, the National Park Service said Friday. The cause of death of the big cat known as P-64, which had a home range in the Simi Hills, the northern Santa Monica Mountains and the southern Santa Susana Mountains, has not been determined but its "paws were visibly burned." The wildfire broke out Nov. 8 and destroyed 1,643 homes and other structures. Three people also died in the fire, which was fully contained by Nov. 21. Their names have not been released and identifications are pending, the Los Angeles medical examiner’s office said. The fire forced the evacuation of Malibu and other communities and burned nearly 97,000 acres, officials said. "P-64 was a fascinating cat to study because he crossed our notoriously deadly freeways dozens of times," Jeff Sikich, biologist for Santa Monica Mountains National Recreation Area, said in a statement. The mountain lion crossed the 101 freeway multiple times, using a long and narrow storm drain, earning it the nickname "the culvert cat." It crossed the 101 and 118 freeways a total of 41 times in the nine months researchers had been tracking it. While almost all the 101 crossings were likely through the culvert, some of the crossings of the 118 were likely on the surface, although there is also tunnel in the area, said Kate Kuykendall, an NPS spokeswoman. 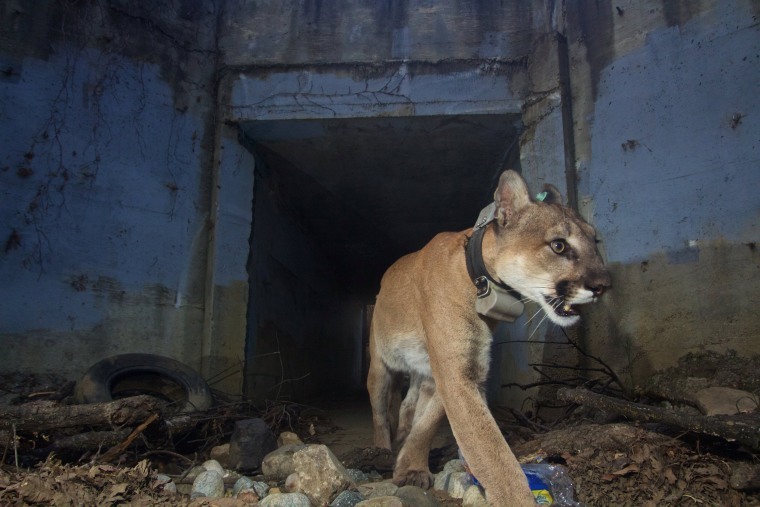 If you would like to learn more about P-64, the Culvert Cat who crossed the 101 & 118 Freeways more than 40 times and all the other mountain lions in our study, please check out our Puma Profiles at https://t.co/3KiC8AvB3k. The remains of the approximately 4-year-old male mountain lion were found Monday after Sikich hiked to the location of the last known GPS point recorded on a tracking device, the NPS said. A necropsy, or an autopsy done on animals, will be performed by the California Department of Fish and Wildlife to determine a cause of death. P-64 was only the fifth mountain lion to be successfully documented crossing the 101 freeway since the NPS began tracking mountain lions in 2002, NBC Los Angeles reported in March. The animal was first captured in February of 2018 in the Simi Hills, the park service said. The animal appeared to have been dead for a few days when it was found, the park service said. After the fire broke out, P-64 traveled throughout the Simi Hills for the next few days, covering several miles before "then hunkering down in a remote area," the NPS said. The mountain lion was located with a telemetry device on Nov. 26, more than two weeks after the fire started, in an unburned area of the Simi Hills and gave researchers hope that P-64 was on a kill and surviving in the aftermath of the blaze, the park service said. Another mountain lion, a young male called P-74, is believed to have died in the Woolsey Fire or its immediate aftermath, the park service said. Of the 13 mountain lions tracked by researchers in the region, 11 were in or around the fire perimeter and nine of those survived. Perhaps the most famous of the mountain lions tracked is P-22, whose range includes popular Griffith Park in Los Angeles. The mountain lion population in the Los Angeles area is genetically isolated because of freeways and human development, which has raised fears about their long-term viability, Kuykendall said. A project to create a grassy bridge over the 101 freeway in Agoura Hills to help wildlife move is in the works and could occur in 2022, and the Woolsey Fire "really underscored the benefits of the crossing," she said.